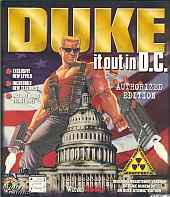 In this addon to Duke Nukem 3D, the president was kidnapped and one travels as Duke to Washington D.C. and clears up enemies in the White House and the surroundings. Duke Travels through the White House, Lincoln Memorial, FBI Headquarters, Smithsonian, the Naval Institute, Capitol Building, NORAD, Subway System, D.C. Sewers, the Naval Weapons Plant and more! Includes 9 new levels plus one secret level. It was created by the winner of the Total Entertainment Network's contest to develop the best independently designed and produced map levels for the original Duke 3D. In 2013, a Duke Nukem 3D: Megaton Edition by Devolver Digital that included Duke Caribbean: Life's a Beach, Duke it out in D.C., and Duke: Nuclear Winter used a new engine that runs natively under new operating systems with enhanced OpenGL graphics.